Prepare soba noodles according to package instructions. Drain, rinse under cold water, and set aside. Blend most of the peanuts into a smooth paste. Add soy sauce, sriracha, water, and olive oil to make a creamy sauce. Add more water as needed to keep it thin enough to coat the noodles. Chop remaining peanuts and thinly slice green onion. 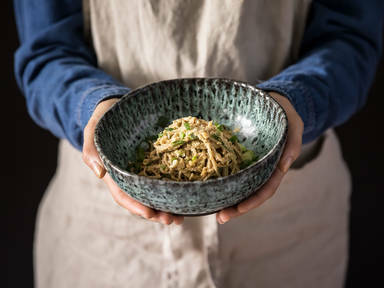 Mix noodles with peanut sauce in a serving bowl. Serve garnished with chopped peanuts and green onion. Season with pepper to taste. Enjoy!